The tomb contains paintings of a prominent priestess, plus a rare image of a dancing monkey. Archaeologists have uncovered a 4,400-year-old Egyptian tomb that they believe belonged to a high-ranking priestess. The Egyptian government revealed the new discovery on February 3, 2018, noting that this tomb on the Giza plateau contains rare wall paintings. The researchers say this tomb belonged to Hetpet, a priestess for the goddess Hathor. Often depicted as a woman with a cow’s head, Hathor is associated with fertility, music, love, among several other qualities (including drunkenness). 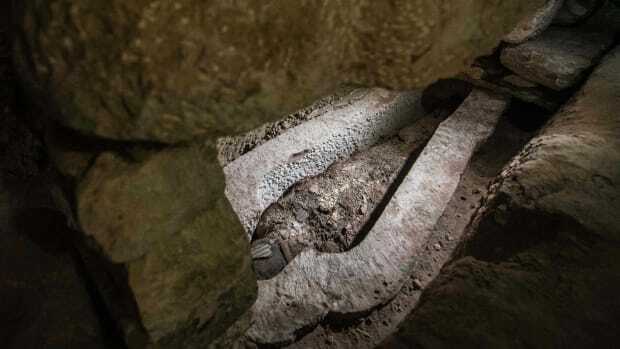 They concluded this tomb belonged to Hetpet because it contained a purification basin engraved with her name and titles, reports Agence France-Presse (AFP). 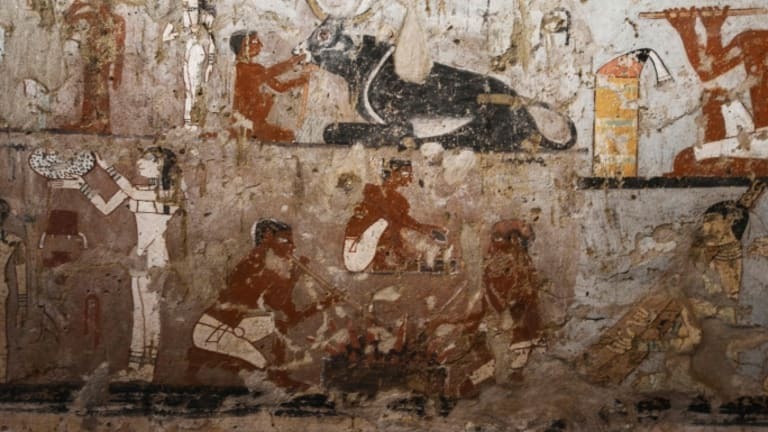 In addition, some of the tomb’s paintings depict Hetpet hunting, fishing, or interacting with children. Hetpet’s tomb stands in the Saqqara necropolis, a famous burial ground for the Ancient Egyptian capital of Memphis. The necropolis contains many of the tombs of top Egyptian officials during the Old Kingdom’s Fifth Dynasty, which lasted from about 2465 to 2323 B.C.E. 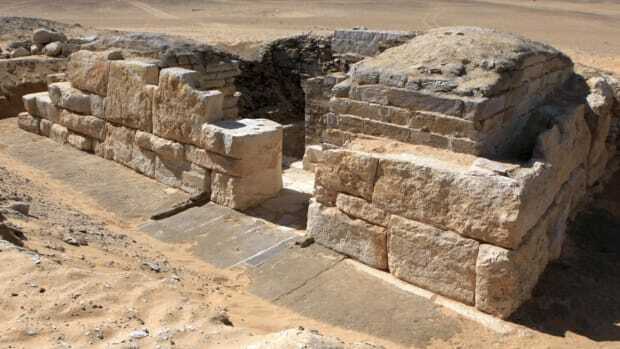 The Antiquities Ministry said that Hetpet’s tomb matches the Fifth Dynasty’s style and architecture. It also contains a rare paintings of a monkey dancing in front of an orchestra, further tying the tomb to the Old Kingdom (this was the era in which Egypt perfected pyramid construction). 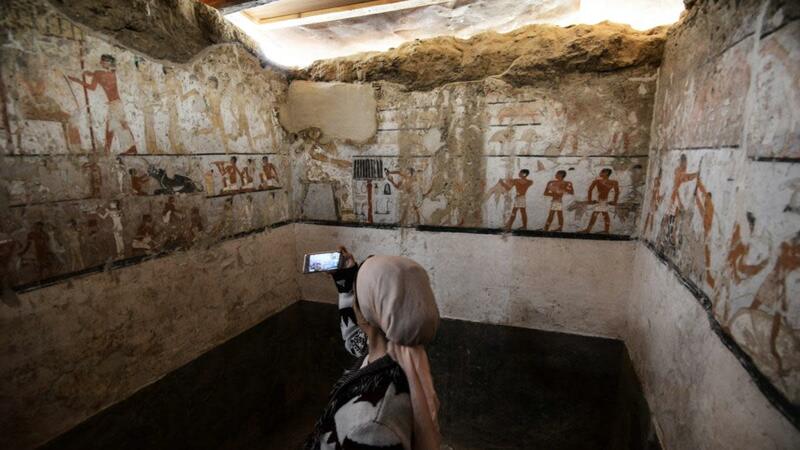 “Such scenes are rare … and have only been found previously in the [Old Kingdom] tomb of ‘Ka-Iber,’ where a painting shows a monkey dancing in front of a guitarist not an orchestra,” Waziri told AFP. Ka-Iber’s tomb, too, is located in Saqqara. 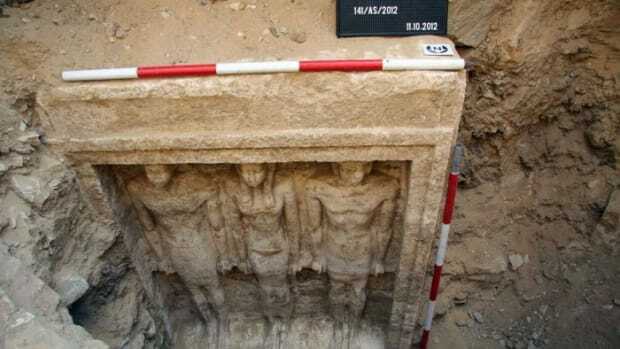 Hetpet’s tomb marks the first archaeological discovery of the year for Egypt’s Antiquities Ministry, which plans to continue excavating the site. 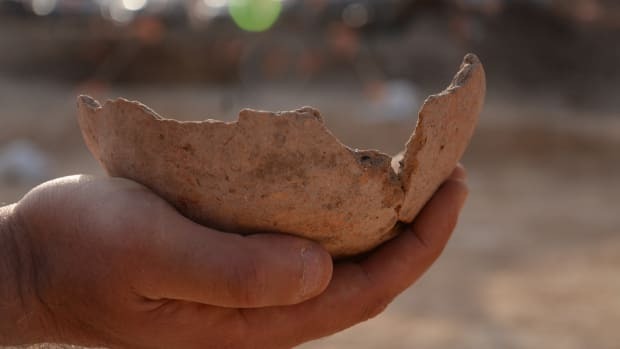 It follows on the heels of the country’s discovery of a 3,500-year-old tomb in September 2017. Egypt’s archaeological wonders were an huge economic draw for the country during the 1990s and early 2000s, when international tourism grew from under 3 million visitors to a peak of 14 million in 2010. After that, tourism started to decline, dropping to 9 million in 2015, according to the World Bank. 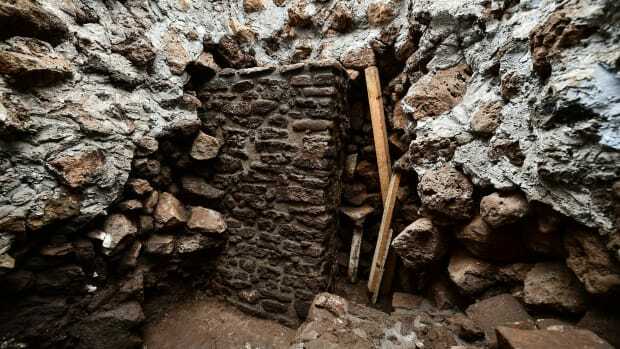 The government hopes these newly-uncovered tombs will boost the country’s flagging tourism industry. 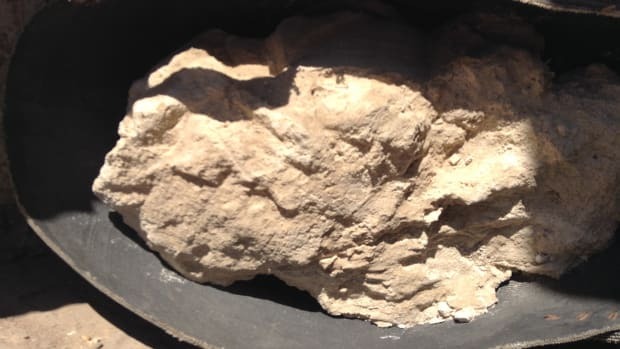 And to that end, the Antiquities Ministry is hoping to continue making newsworthy discoveries. If its succeeds, the result would be not just a boon for Egypt’s economy, but a gift to history-lovers worldwide.